Thursday 18th May 2017 - A mixed bag of lovely warm sunshine and heavy squally showers! 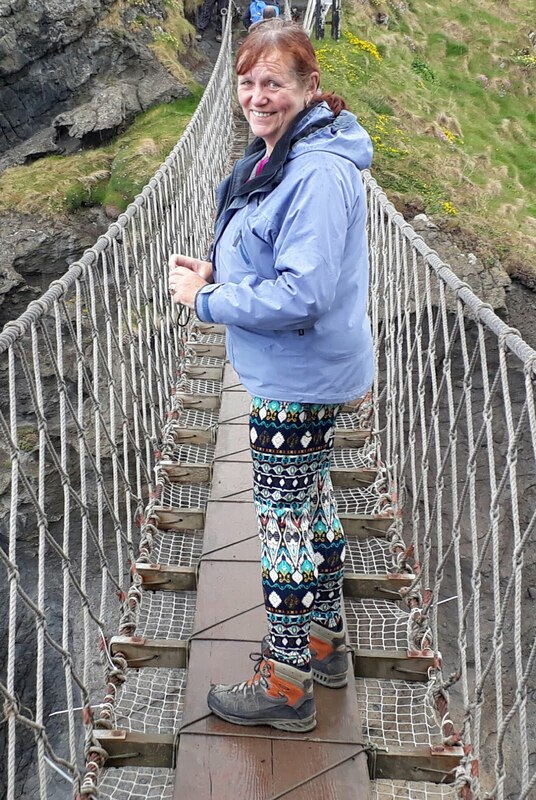 Today our plan was to visit Carrick-a-Rede and Larrybane Quarry - an area that belongs to the National Trust, and one where a rope bridge can be found that can trace it's history back for 350 years. The site was only about a mile and a half from our campsite, so as usual, our picnic was soon packed and off we went on 👣👣👣 heading for our goal - but at that stage we did wonder if we'd be able to complete our visit because to keep numbers under control in this beautiful area the Trust run a ticket entrance system and only so many are available each day. However, we needn't have worried because when we arrived it wasn't really very busy at all and we just sailed straight in! The name of the place - Carrick-a-Rede - means rock in the road - the road being the old sea route for Atlantic salmon on their westward journey past Carrick Island. History has it that for over 350 years fishermen in the area strung a rope bridge 30 metres above the sea to allow them access to the best places to catch the migrating salmon that were making their way back up stream to spawn. Apparently, on a good day the fishermen might expect to catch as many as 300 fish, and then balancing their catch on their backs and holding on with one hand they would venture back over the swaying bridge. Sadly the salmon have disappeared now so these days all that is left are the 'stories', a new rope bridge and the breathtaking views that people come to see. The signboards here challenge you to follow in the foot-steps of the salmon fishermen and feel the sway of the new rope bridge that is suspended almost a hundred feet above the crystal clear blue/green sea - and that is exactly what we did - but the rocking motion made for a white knuckle grip as you crossed, and glancing down almost made me become unbalanced! Once we'd gained the far side and were safely on Carrick Island we took our time exploring the high cliffs that were festooned with nesting birds, and we even managed to find a deserted spot to sit and sip our coffee while we watched the ocean waves crashing up onto the cliff faces. We made our return journey via the same route across the bridge, but on the way back we learnt another interesting fact - the bridge crosses the mouth of an ancient volcano! As we looked back towards the mainland we could see dark rock forming a wide vertical pillar up through the white chalk - this was basalt or cooled lava that had erupted from the Carrick-a-Rede volcano over 60 million years ago! By now, as it was nearly lunch time so we were on high alert for spotting a comfy dining area and this we found a short distance away within the confines of the now disused Larrybane Quarry. Here we discovered towering lime stone cliffs where crags and cracks abounded, and it was within their shelter that we nibbled our sarnies as a squally shower passed by. This area was also used for some of the filming of Game of Thrones, and as we later stood on the cliffs above it was easy to imagine the marauding hordes battling in these surroundings! NNext, our walk took us onwards into Ballintoy Harbour where we treated ourselves to ice-cream while we sheltered from another squall! 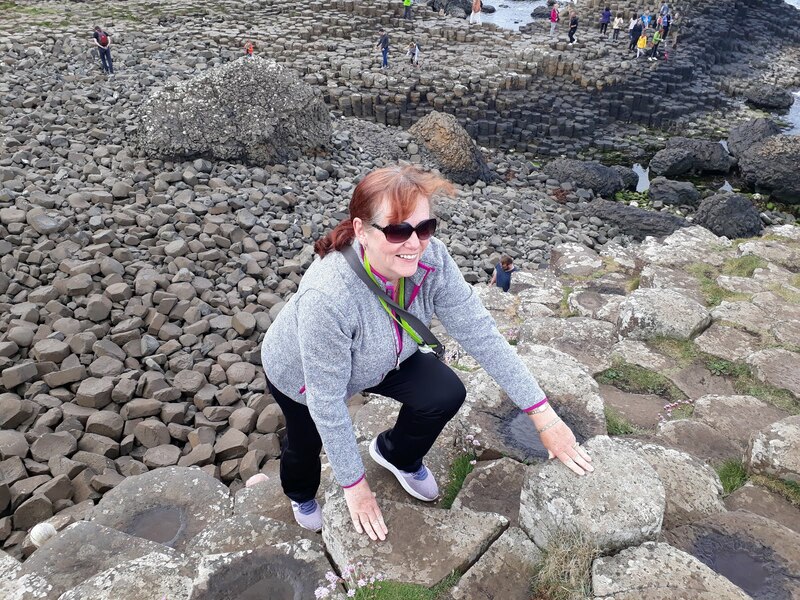 But it was absolutely no hardship to pass the time there because the views out over the the ocean with its numerous basalt stacks that in the past have contributed to making these waters treacherous was mesmerising as the tide started to race in. And then finally, all that remained was for us to retrace our steps back the way we'd come with our fingers crossed that we could beat any further rain showers home. Friday 19th May 2017 - Mostly warm and sunny in the morning but with a few showers in the late afternoon. This morning we left The Glenmore Hotel Campsite and headed for The Giant's Causeway - another National Trust Property, and one that is said to be a Geological wonder that is steeped in legend and myth! We arrived about 11am, and once again we seemed to be ahead of the crowds which added to our pleasure of exploring this magnificent place. We entered the UNESCO World Heritage Site through the visitor centre which has been designed to blend into the landscape with it's walls of glass, grass roof and basalt columns, and it blends in so well that it almost disappears when observed from the coast side. Once inside we found loads of interactive 'toys' and displays that informed us about the geology and science of the area, and while we were there we discovered that the 40,000 interlocking hexagonal basalt columns that the Giant's Causeway is made up from are the result of intense volcanic and geological activity which took place 60 million years ago, and that some of it's uniqueness is the result of the cooling and shrinking of successive lava flows. However, I found the other 'stories' more entertaining and these were expanded upon by the Audio Guide that accompanied us on our walk. The tales were mostly about the gentle giant Finn McCool who stood a mere fifty two feet six inches tall - a relatively small giant!!! But across the sea in Scotland there was a rival who was much bigger and his name was Benandonner. The tale tells how the two giants hollered across the sea of Moyle, each demanding a trial of strength. This was agreed upon, and Finn offered to make the contest possible by building a rocky causeway between County Antrim and Benandonner's lair - Fingal's cave on the island of Staffa. However, the work was hard and Finn fell into bed and slept heavily from exhaustion, but early the next morning Finn's wife Oonagh was woken by the sound of thunderous footsteps and she knew she would have to think quickly to save Finn! She covered him with a nightgown and bonnet, and then told Benandonner 'to be quiet or you'll waken the bairn👶'. At this Benandonner panicked! If the child was this big, how much bigger might Finn be? He hastily retreated across the causeway, ripping up some of the stones in his wake! And I suppose after that they all lived happily ever after! red difficult one, which once we'd climbed the 162 steps of the Shepherd's Staircase offered us panoramic views of both the Causeway and the Wider World Heritage site. And it was as we were climbing that we learnt about the 'Kelp' In times gone by the seaweed was gathered by women and children for the extraction of it's minerals and also to be sold as fertiliser. But once it had been collected it had to be transported up the cliff face to the road, and apparently this was done by the women who carried large quantities of it balanced on their heads - but that was in times before the stairway had been installed. Those poor souls had to scramble up the almost perpendicular cliffs unaided! After our visit we debated what to do for lunch - should we stay in the car park with it's limited views or should we drive on and see if we could find somewhere better. 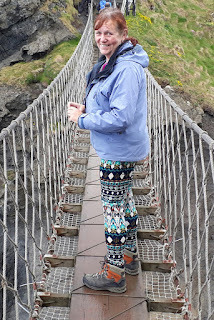 The latter won and the road led us though the town of Bushmills which is famous for it's whiskey, and then on past the atmospheric ruins of Dunluce Castle which stands overlooking the ocean. And immediately after that a perfect dinning room presented itself in the form of a picnic site high above the crashing waves, so that was where we sipped our tomato soup along with some freshly baked dunking bread - perfect! 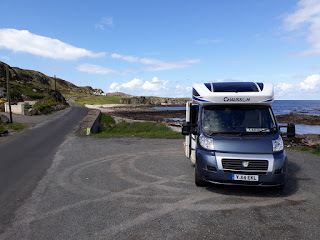 Then it was forwards and onwards into The Republic of Ireland and to tonight's resting spot which was a deserted (and free) car park just above Stroove beach - a place we found using our Camper contact app. Saturday 20th May 2017 - Mostly a lovely sunny day but with 2 torrential downpours! This morning we were a bit undecided what to do - should we go for the 8.5 km walk to Inishowen Head or should we settle for a shorter trek to Port-a-Doras - a small portal through what at first appears to be solid rock. We opted for the latter, mainly because there is a distinct lack of parking places and campsites in this area, and as we were unsure where we'd be resting tonight we didn't want to linger to long here. We left T4rdis2 in the car park and strolled first through a field full of noisy sheep, and then following a vague rough path we traversed along the rock strewn shore line until we came to a large outcrop that seemed to be blocking our way. However, here we found the small natural doorway in the rock that led us into an amphitheatre pebble beach with high towering cliffs on 3 sides and the ocean on the 4th, but that direction was guarded by about a dozen Cormorants on sentry duty! The beach was really quite breathtaking mostly because of the many weird rock formations that the elements had carved over the millennia - if you used your imagination you could almost make them into seals or mermaids basking in the sunshine! However, that episode of sunshine didn't last long, and on our way back we got lashed by the rain as the first heavy squall of the day passed over! Next on our agenda was Malin Head and Banba's Crown - a place we ended up visiting twice! Malin Head is Ireland's most northerly point and lies at the very tip of the Inishowen Peninsula and can only be reached on foot. To get there most people park at Banba's Crown - a hill with an old signal tower at the top which was built by the Admiralty in 1805, but it also has several other claims to fame! It is the place where folk stood to wave goodbye to their loved ones as they set out across the sea to a new life in America, and more recently, the huge word EIRE has been set out in white stones on the grassy slopes so that World War 2 pilots knew they were flying over neutral territory. Also Malin Head has a long history in relation to communications - it was through here that news came of the American Gold Rush in 1848 and of the shooting of President Lincoln in 1865, and today many would know it for it's shipping forecasts. But why did we visit twice? Well the first time we followed the route we went up in T4rdis2, but as the road became narrower and steeper we became a little worried, and then when we got to the top the small car park was closed resulting in cars being littered into almost every small space available! And their was definitely no room at the inn for us to park our rather large ship, and neither was there much room for John to turn us round. However, in the end he found a small gap, and almost on a surface no bigger than a shilling, round we spun! So then we had no choice other than to trundle back down the hill and to retrace our tyre tracks for about 2 miles to a parking space we'd spotted earlier. By now it was lunch time so we ate our sausage sandwiches while gazing at the rugged coast with it's myriads of birds searching for theirs! Then it was back up the hill but this time on 👣👣👣! We once again passed through the busy area of Banba's Crown and then we continued on down a track that led us past the wild and windswept dramatic cliffs that lead up to Malin Head itself. Apparently this part of the coast has some of the most treacherous waters in the world and it's been the site of over 400 ship wrecks in the past, and when you see the jagged crags rising up out of the water that really isn't much of a surprise! But what was a surprise was the fact that some of the Star Wars Episodes had been filmed in this area and that the Millennium Falcon had been reconstructed and perched on the cliffs here in this isolated location. All too soon our time here was done and we needed to potter back to T4rdis2 and start looking for a spot to rest our weary heads. This presented itself in the form of a strange but lovely little campsite at Binnion Bay, but once again, to get there we needed to travel along more narrow lanes with our fingers very firmly crossed that we wouldn't meet anything coming the other way! It would be so much easier if this T4rdis could dematerialise like it's namesake!